Enter your email address to join the movement. With more intensity than ever before, Americans want to buy American. Finding Made in the USA products has become more and more difficult as outsourcing American manufacturing has become more profitable, especially for the larger corporate conglomerates that have money to lobby Washington to continue increasing their bottom lines. Today’s lobbyist are spending mega dollars to persuade our politicians to not change the policies and laws that have resulted in American manufacturing falling drastically from the #1 position worldwide we once were. IT IS TIME FOR INDIVIDUALS TO COME TOGETHER AS ONE! Alone or in small groups, our voices are just whispers in Washington. As Patriotic Supporters of The Made in America Movement, we will join our voices together to make sure Washington hears that Americans want to bring our jobs home and rebuild the American Dream. 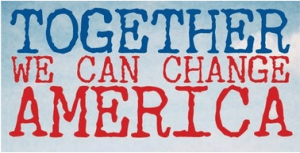 The Patriotic Support Division of The Made in America Movement is a non-partisan, nondenominational coalition of individuals wanting to help effect changes that will make reshoring more attractive than outsourcing. We MUST build a roster of voters that will be loud enough to compete against the rich lobbyist in Washington. 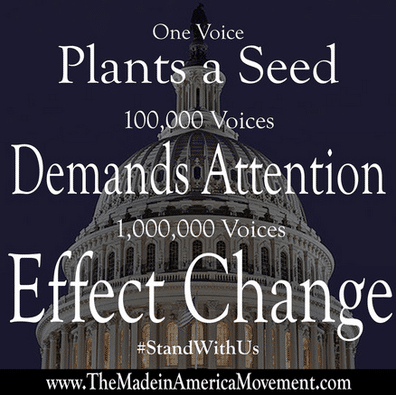 Our goal is to have a pool of at least 1 million Patriotic Supporters to sign petitions telling Washington to take immediate action to bring American manufacturing home – we will take action with the digital Million American March!